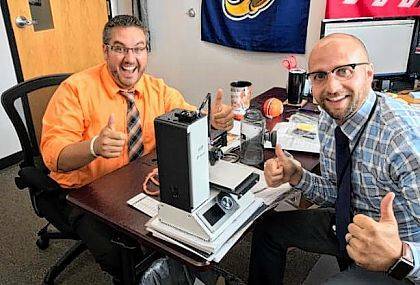 Assistant Principal Nick Guidera and Principal Chad Lensman are excited to receive a 3D printer from Learning Blade. ST. PARIS – Graham Middle School is fully embracing STEM education. Determined to enrich the learning experience by engaging students with quality STEM content, principal Chad Lensman has piloted two new STEM programs this school year. Both STEM programs, MakerMinded and Learning Blade® are initiatives in Ohio supported by LIFT—Lightweight Innovations for Tomorrow, a national ManufacturingUSA institute, to enhance student experiences and understanding of manufacturing and other high demand fields. MakerMinded is a free statewide competition where schools compete to complete STEM activities for a chance to win a virtual reality classroom station. Learning Blade is a web based STEM career awareness curriculum designed to improve student relevance of middle school academics as it relates to future STEM career paths. Chad Lensman, principal of Graham agrees. “The staff at Graham are excited to innovate. In September, Learning Blade sent us a third 3-D printer and our students already learned to design and print their own concept cars. We are embracing new technology to allow students to achieve new heights in STEM.” Students worked through the lessons and activities in “Manufacturing a Concept Car”, one of the twelve missions in Learning Blade. In addition, Graham students have completed lessons about STEM technologies like Automation and Mechatronics, Paint Technology and Innovative Materials as well as learned about careers such as Mechanical Drafter, Manufacturing Technician and Automotive Designer. The MakerMinded competition then rewarded Graham 8 points for submitting proof of their 3D printed objects to the MakerMinded website. MakerMinded’s Ohio campaign is organized by Battelle through the Ohio STEM Learning Network. The network was founded in 2008 and today represents 44 STEM schools across the state. Battelle manages the Ohio STEM Learning Network as part of the company’s commitment to preparing the next generation of innovators. In addition to receiving MakerMinded points for their work in Learning Blade, Graham has received MakerMinded points for their STEM work hosting a manufacturing guest speaker, hosting a Manufacturing Day, completing a Let’s Start Coding Activity, hosting a STEM movie screening, and participating in an Engineering Design Challenge, to name a few. According to Assistant Principal, Nick Guidera, Graham is developing a culture of STEM throughout the entire district. Students are learning how to problem solve, collaborate and think critically in all of their courses. Students are applying these habits in real-world contexts. For example, MakerMinded is a LIFT initiative available in Ohio, Tennessee, Kentucky and Detroit, Michigan, and exists to get students excited about STEM related careers early in their educational paths, especially opportunities in the advanced manufacturing field. The Learning Blade® addresses the need for STEM career awareness and academic relevance in middle school as that is frequently the reason students do not pursue these careers. By introducing students to more than 100 STEM careers and technologies through the supplemental online missions, it helps to show students how these jobs benefit people and society. Increased student awareness of STEM careers and technologies is a benefit of Learning Blade as recognized by Battelle following an early pilot in Ohio.